Honorable Mayor, Rafael Gómez, the city of Leganés, city officials, Spanish government officials, beloved Ambassador of Bolivia in Spain, greetings to all our Bolivian brothers. Many thanks for your presence and for receiving me here in Leganés, in Spain. I’m surprised by the presence of thousands and thousands of Bolivians, Ecuadorans, Uruguayans, Venezuelans, Colombians, Peruvian brothers, Cuban brothers, so many Latin Americans here together tonight. I want to give you my greatest thanks for this great mobilization, this great integration of all Latin Americans in Europe. But I also want to express our respect to the Spanish people. Thank you very much for your presence and for having organized this large meeting of people of the world. Listening to the speeches given by various sisters and brothers from Spain, I’m surprised by how they’ve followed the process of liberation in Bolivia and in Latin America, surprised by their following of the deep social, economic and political transformations. Surely many of you here now know how we organized, first through the unions, socially and communally, in order to change Bolivia, and of course, to change Latin America. If we speak of change, one of the changes, justly, is the liberation of the people of Latin America. In Bolivia, together with the Bolivian Worker’s Central, the different social movements, [it is] a permanent struggle against the economic models that have so damaged Bolivians. If we recall the situation of the policies implemented during the republic, before the republic, the original indigenous people, the Quechua, Aymara, the Guaraní, it is a permanent struggle against the looting of our natural resources, a permanent struggle for equality between indigenous, mestizos and criollos of those times, for a new way of life, of equality and dignity, but also a permanent struggle for the respect of our rights, the right above all of the indigenous people, the most abused sector in Bolivian history and the history of Latin America. A tough resistance, a rebellion against the colonial State, a rebellion of the people against the looting of our natural resources, a permanent rebellion against the forms of subjugation. And these struggles, I want to tell you, brothers and sisters of Bolivia, have not been in vain; from the union struggle, the social struggle, the communal struggle we went to an electoral struggle. I remember perfectly well when I arrived at Chapare in 1980, when there were negotiations with the governors and when the union leaders, ex-union leaders brought up the idea of structural changes, and the response of the neoliberal governors was that the campesinos, the indigenous, had no right to political action and that our proposals to change the subject or the agenda of the negotiations were questioned, that they were of a political character. I remember that they told us (I was a delegate from the base), they told us, you are making political proposals and they will not be heard; they told us that the politics of the indigenous campesino movement in the tropical zone of Cochabamba were the axe and the machete. In other words, manual labor, and we did not have the right to political action. And in the altiplano, it was the shovel and the hoe; the shovel to work and the hoe to work as well. Little by little that social movement went about breaking the fear of politics. A few had the right to political action and the majority, the workers and laborers, we didn’t have that right and when a worker, a miner, during the sixties, seventies, eighties acted politically, he was accused of being a communist. We salute the Spanish Communist Party, the Socialist Party, we salute the humanists here, many thanks for having taught me how to defend life. We’ve had so many meetings, but I want you to know, brothers and sisters of Latin America, of Europe, social movements of this continent, our union leaders, in the ‘60’s and ‘70’s they were accused of being communists and persecuted, the coups d’etat, the military coups, in order to do away with the union leaders from the mining sector. So then, the doctrine of North American imperialism was to accuse them of being communists, and with that motive, there were massacres in the mining centers and many of the brothers who were mining leaders escaped, sometimes to Europe. I want to express my deep respect and admiration for the accommodation that was given to many of those mining brothers, campesinos who escaped to Europe in order to survive. Surely the humanist, communist, socialist governments have given them the shelter here of political asylum. Afterwards there came another doctrine. This was the fight against drug trafficking. I remember perfectly well how in the eighties and nineties, the union leaders were [called] drug traffickers, another persecution by the empire, and after September 11, 2001, the union leaders were accused of being terrorists. Surely some brothers will recall that some said that Evo Morales was the Andean Bin Laden, that the cocaleros were the Taliban, and with this pretext, [came] another political doctrine of zero coca, as a way of expelling the campesino movement from the coca producing zone, and to say – I want you to understand me – that we’ve borne permanent interventions, at times of a military character, to attack this rebellion of our people in Latin America. These struggles, whether they be of workers or indigenous, these mestizo struggles, these struggles of intellectuals such as Marcelo Quiroga Santa Cruz, these struggles of revolutionary fathers such as Luis Espinal, a Spaniard who gave his life for the poor of Bolivia and, like Luis Espinal, this struggle of military patriots such as Germán Busch, such as Lieutenant Colonel Gualberto Vallarroel, I want to tell you, brothers and sisters, it has not been in vain. A struggle, of course, peaceful, democratic, in order to reach the government, the Palacio Quemado, and from there to change economic and social policy. Something happened, I want you to listen, Bolivian sisters and brothers: since 1940, Bolivia has never had a fiscal surplus, not until 2005, before I became president. Afterwards, in 2006, we nationalized and recovered our hydrocarbons, and in Bolivia in the first year of our government, 2006, we had a fiscal surplus. Bolivia’s status as a beggar, that had to borrow money to come up with petty cash, is over. In 2005 Bolivia’s international reserves were $1.7 billion. The day before yesterday, we were at the Bolivian Central Bank signing an internal loan and the president of the Central Bank of Bolivia told me that now we have $8.5 billion in international reserves. From $1.7 billion in international reserves. Imagine, sisters and brothers, during the twenty years of neoliberal government, how much money went out and where it went, surely to economists, experts in financial subjects in Europe and Spain and Latin America. I’d like you to help me investigate the looting of our natural resources. How much money has Bolivia or Latin America lost, in recent years, how much money have we lost, at the expense of so many social benefits? It wouldn’t take much but it would be a relief for many Bolivian families. Now we have the reserves and now we have the surplus. Since last year we’ve been told that there’s an economic crisis of capitalism, a financial crisis. They’ve frightened us, they’ve brought fear to see how we will face it. I thought truthfully, sisters and brothers, that this financial crisis would affect us terribly. I imagined we’d not have a commercial surplus. I want to tell you, Bolivian sisters and brothers, that on July 30 of this year, the positive commercial balance was $300 million. Bolivia has never had a positive commercial balance. And this is why, sisters and brothers, I’m convinced about democratic structural changes, and when there is a sector in opposition, it’s better to take it to the Bolivian people, in a referendum. Now, Bolivians don’t only have the right to choose their national leaders or their departmental leaders, in addition to municipal leaders. Now the Bolivian people have the right to decide through any referendum, economic policies for the Bolivian people. They are referendums that we never had before. But also, thanks to the new political Constitution of the Bolivian state, Bolivians don’t only have the right to select their national, departmental, municipal or parliamentary leaders. Now with the vote, the same people have the right to revoke any president, vice-president, parliamentarian, prefect or mayor doing badly in their area, they have the right to revoke them through their vote. This is a deep democracy that is not just representative, it is participative, where decisions are taken with the vote of the conscience of the Bolivian people. But I also want to tell you, sisters and brothers, the norms, the procedures to administer the state may also be changed in Bolivia. For the first time in 183 years of republican life, the Bolivian people approved a new Constitution; that had never before been done, it was only the political class, the parties or in the end, the party with parliamentary representation who had the right to make reforms to the Constitution. Now the people with their vote have approved a new constitution for the Bolivian state. That is, we even change Constitutions. I want to tell you, sisters and brothers, we have a great weakness, which is changing the mentality of public officials. There are still some who do not understand what it means to be a public official. I’ve said, I don’t need ordinary public officials, I need revolutionaries at the service of the people. There’s a mentality, I’d call it a colonial mentality, an inheritance of paternalism, of bosses, of looters, of exploiters; that mentality is not easily changed and it’s one of the weaknesses that Bolivia still has. However, despite these weaknesses we are beginning to change, it’s not enough, surely the participation of the social movements in these profound transformations will continue to be important. Recently our foreign minister from Spain said to me, “There’s a lot of movement happening in Bolivia, election after election, campaigns for referendums, sometimes revocations, sometimes to approve a new Constitution.” My answer was that before, there were coups and military coups, now there are elections and elections. I am very content, although there may be elections and referendums every year, but not coups d’etat. But I also want to tell you, in our new political Constitution of the Bolivian state, approved by the Bolivian people, no kind of foreign military base whatsoever, even less one from the United States will be allowed. And I want you, brothers from Europe, from Spain, to understand me. In Latin America, where there are U.S. military bases, there are military coups, the peace is not guaranteed, democracy is not guaranteed, and I speak with great authority, because I have been a permanent victim throughout the ‘90’s and part of the ‘80’s, part of first decade of this century, of the presence of foreign armed military, particularly from the United States. Happily, thanks to the conscience of the Bolivian people, that has come to an end. I must ask the social movements of Europe and the world: help us to do away with military bases in Latin America. All in the interest of life, democracy and peace and social justice. Thank you very much, sisters and brothers, I think you care for me more here in Spain than in Bolivia, thanks very much. 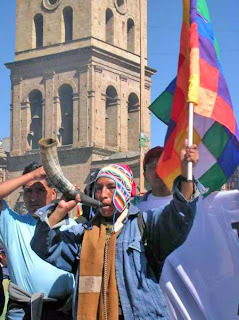 I’m sure, sisters and brothers, the process of liberation, the process of profound transformation, not only in Bolivia, but in Latin America, is a one way path. The process of transformations in democracy is unstoppable in Bolivia. Why do I say this? You, as brothers who live here, ought to be aware, a number of times neoliberal groups from the fascist, racist rightwing, tried to remove me from the government and I remember it perfectly. The first year of my government, they said, poor little Indian, he’ll be there three, four, five, six months, he won’t be able to govern and then he’ll go, they’ll get rid of him. That was in 2006. In 2007, what did these groups say? I believe that this Indian is going to stay quite awhile, something’s got to be done. 2008. In 2008 they did something. And what did they do? First they tried to get me out by the vote of the Bolivian people – the vote to revoke my mandate. I accepted: let’s go to a vote. You know that we had won the elections with 54%. In this revocation referendum the Bolivian people ratified us by 67%. When they failed at that, when the revocation failed and they couldn’t revoke me through the conscience of the people, last year they tried with a civil, not military coup d’etat. And now I’d like to salute the European countries, defenders of democracy, UNASUR, and the United Nations for defending democracy – with their civil prefectural coup d’etat they failed as well. And so we have the great triumph of the Bolivian people in politics and constitutionally. And this year, thanks to the efforts and conscience of the people, a new Constitution has been approved. Now we are obliged to apply and implement this new political Constitution of the Bolivian state, which honestly, some European countries tell me that in regard to its social rights, is more advanced than any European country. And of what rights do we speak? We’re not just talking about individual rights, we’re not just talking about political rights; this new political constitution of the Bolivian state also respects collective rights. For example, all basic services are a human right, and if it is a human right, it may not be a private business, but a public service. Sisters and brothers, I can talk a lot about this new Constitution of the Bolivian state, but I’m also sure that there are some demands that we’ve been unable to resolve, particularly in foreign service. I found that the Bolivian state, as it is now known worldwide, is the pluri-national state; in this pluri-national state is the diversity of the human beings who inhabit this land of Bolivia. I found, for example, barely two [Bolivian consulates] in Spain, in Madrid and Barcelona. Now we are opening another consulate in Murcia – I know it’s not sufficient; we’re talking about extending the consulates to six, in four or five cities in Spain, including the Canary Islands, Tenerife, or finally, Majorca, Menorca, that at times I’ve been able to visit, sisters and brothers, to attend to the problem that we have, the subject of migration and corresponding documentation. But I also want to tell you, sisters and brothers, surely from the embassy in Spain, where all the consulates report, thanks to the understanding of the Spanish government, about certain important subjects. The subject, for example of drivers’ licenses is well underway, even an agreement about reciprocal voting; that is, Bolivians resident in Spain may have the right to vote in municipal elections. We hope to reach agreement on that during this visit, the vote in Spain. A subject that has been a permanent concern; the vote from abroad. I want you to know, sisters and brothers, that from the [presidential] palace, we are directing a project that resulted from a 2005 law in the National Congress. Happily, the chamber of deputies approved the vote from abroad without any limitation. But from 2006 to 2009 the Senate has not approved it and you know furthermore, why the Senate has not approved it: the neoliberal Senators are very afraid of the brothers who left Bolivia in search of better living conditions. At last, with so much pressure in Bolivia and Argentina, I know that here you’ll also mobilize to pressure the National Congress to approve a law that will allow for voting outside Bolivia, that was approved for the first time, even though it’s not as extensive as I wanted. It was approved up to a certain limit, but that will be fixed, sisters and brothers, the moment in which congressional representatives who share the feelings of many brothers who live outside Bolivia, now we’ll dedicate ourselves to seeing that the vote from abroad is not limited. I am not in agreement with the idea of limiting it; it’s a way of moving against human rights, the right of Bolivian citizens living abroad. But we will start this year, this year with the foreign, although limited, vote. Sisters and brothers, until now you’ve listened to the subject of migration. I want to tell the countries of Europe and the world, especially of Europe, its governments, that there will also be a debate, as before, Europeans, Spaniards, came to Bolivia and our grandfathers never said they were illegal. Now that Latin Americans come to Europe they cannot be declared illegal, because everyone, we all have the right to inhabit any part of the world, we all have the right to live in any part of the world, respecting the norms of each country, but to declare us illegal is a great mistake; this is where I differ from the United Nations. Happily many countries are joining us in our proposals, and we hope that soon the United Nations will establish norms that will allow for these so-called immigrants to be recognized as legal persons, I repeat, respecting the norms of each country, whether they are investors or people who come looking for better living conditions, rest assured, sisters and brothers, this will be another battle, another battle for our sisters and brothers, whether they are Europeans in Bolivia, Latin America or Latin Americans in Europe. They must be declared legal persons who live by their labor, who live to improve their economic or social condition. There’s another central subject, sisters and brothers, the subject of the environment. Surely there are plenty of Paceños here. Imagine that Chacaltaya, our Chacaltaya has no more snow. In Potosí, Chorolque, there’s no more snow – I’m sure there are Potosinos here as well. These mountains of the Bolivian altiplano, of the La Paz altiplano, are daily losing their white poncho. We must ask ourselves who’s responsible. The capitalist development model, the exaggerated and unlimited industrialization of certain western countries [is responsible]. However, this problem affects all of humanity. Therefore I want to tell you, I’ve reached the conclusion, the following conclusion: right now, in this new millennium, it’s more important to defend the rights of mother earth than the rights of human beings. If we don’t defend the rights of mother earth, it’s useless to defend human rights. To our humanist brothers, to so many social movements, groups, intellectuals, personalities who dedicate themselves to defending the environment, as well as mother earth, I want to say, let’s come together, let’s work together, let’s help our presidents, our governments who defend the rights of mother earth and everyone who defends the environment, as well as the rights of the earth; defending planet earth in order to save humanity. If we do not come together, if we do not orient ourselves, if we don’t work together, 20, 30, 50 years from now, what will be the situation of any human being? I mean, whether they’re indigenous, laborers, business owners, corporations, life is not assured. The only way to guarantee the life of the human beings who inhabit this planet earth is by defending mother earth. It’s time to take on this huge responsibility and we all have this noble and sacred assignment of defending the environment. I call on the so-called industrialized countries to begin to think seriously of canceling the climate debt, a historical debt resulting from having caused so much damage to the environment. I feel that in this millennium we must assume this responsibility in order to defend humanity. Sisters and brothers, I know that you have come from many different places. Greetings to brothers who came from faraway cities in order to see us, to greet us, to applaud with everyone here, to the brothers who came from the islands, to the Latin American compañeros who came to share this moment and to the organizers, thank you to the mayor of Leganés for allowing us to gather here. For my part, I want to tell you, brothers, sisters, thank you very much for everything. Until we meet again, we will continue working for equality, for dignity and for the good of Bolivians and all Latin Americans, for their liberation that is beginning in South America. Thank you very much. A person from La Paz.